DVD formats or digital versatile disc formats started to become available in 1997 with the introduction of the DVD movie disc. Initially, the DVD format was just for digital video and was intended to be the replacement for VHS videotapes. However, as was the case with the compact disc, manufacturers eventually created new formats for the storage of digital information after the original movie format was well adopted by consumers. As a result of the creation of other formats, the term DVD which initially stood for digital video disc was essentially changed to digital versatile disc because the disc could be used for a lot more than just digital video. Most simply refer to this disc format as a DVD. The acceptance of DVDs by consumers was substantially quicker than it was for the compact disc. The main driving force behind this was that people were already quite familiar with the CD, which was introduced about 15 years prior to the DVD movie disc. Acceptance was also buoyed by the fact that the DVD was a disc format that had the same size as the CD, the same thickness as the CD, and the same look. The popularity of this format became so widespread that certain companies used innovative ways to incorporate the DVD into their products. 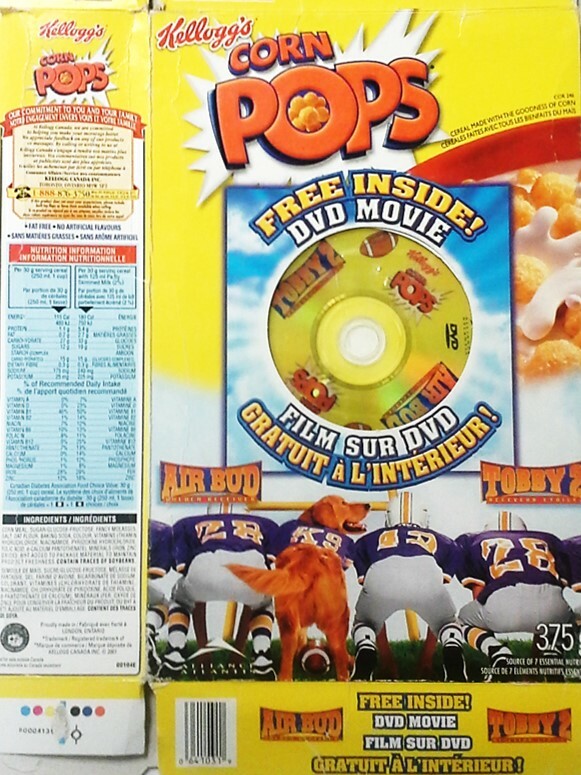 Below is an example of a free DVD movie disc give away with the purchase of a cereal. The only problem was that existing CD players could not play DVDs and therefore, new equipment needed to be purchased. Fortunately, many of the new DVD players could also play CDs and this helped ease the pain of buying additional equipment. Despite the obvious similarities between CD and DVD formats, there are some key differences in disc structure. One example of these differences is that certain digital versatile disc formats can have more than one information layer, whereas CDs can only have one information layer. These types of DVDs are called dual layer dvd media. DVDs have a higher storage capacity. A single information layer DVD can hold about seven times more than a CD (4.7 GB for DVD versus 700 MB or 0.7 GB for a CD). DVDs do play in a spiral pattern from the inside out and are read from the non-labeled side as is the case for CDs, but the laser that reads DVDs has a different light wavelength. The laser light is still in the red region (650 nm), but this shorter wavelength of light allows for a smaller laser spot size that is necessary to read the smaller pits and tighter wound spiral on a DVD, compared to a CD. Players or drives must be equipped with laser diodes that can emit the 650 nm of light for DVDs to be readable. Since the DVD disc is read by light it is classified as an optical disc. Digital versatile disc formats have the same three categories or types of discs as compact discs. Read-only discs, where the information is placed on the discs at the time of manufacturing, can only be read and played. Read-only formats include movie DVDs, DVD-ROMs, and DVD-audio. Write-once DVDs are similar to write-once CDs. The discs are purchased blank and then recorded. Once the discs are full, you cannot erased them or record any additional information to them. This format has two similar types of discs known as DVD-R or DVD+R or simply recordable DVD. Finally, the third category allows users to record and erase information many times. These discs are known as erasable DVDs and come in three DVD formats, namely DVD-RW, DVD+RW, and DVD-RAM. Both the recordable and erasable formats can be used for digital scrapbooking storage or storage of any other type of digital files. The archival DVD is a recordable DVD with a gold metal reflective layer instead of a silver alloy one. If longevity of the DVD-R is a concern, then consideration should be given to using this disc format. More information can be found at this archival DVD link. People, especially collectors of movies, are always interested in releases of new DVD movies, so that they can readily add to their collections and perhaps obtain copies of movies not previous issued in the DVD format. The link above provides more information on this topic. Collectors of DVD movies may also look into movie clubs. These clubs are a way of increasing one's DVD movie collection at a reasonable price point. It is also a method of expanding the movie collection with titles not normally found in retail shops. One example of this type of club is the BMG DVD Club. DVD Easter eggs are small hidden surprises that can be found on some DVD format movie discs. The DVD Easter egg page discusses what these things are in more detail and provides tips on how to find them. Information on these DVD formats is provided on this website to help you further understand the key differences between the DVD types. Also, information on deterioration is provided at the Optical Disc Damage and Repair page. Handling and storage of digital versatile disc formats information can be found at the Optical Disc Storage page. The material provided at both of these links will help you make the right decisions in choosing the appropriate DVD media that will allow future access to the stored files. The CD DVD Storage Media page is an additional resource to consult in order to obtain information on the longevity, storage capacity, and costs association with using DVD formats.